Lexus and Hummer took top honors in their respective categories in the J.D. Power and Associates 2010 Consumer Service Index (CSI) Study. Released this time each year, the CSI rankings (based on a 1,000-point scale) measure satisfaction among vehicle owners who visit a brand service department for maintenance or repair work during the first three years of ownership – that wonderful honeymoon phase when factory warranties are still in full effect. The study is designed to focus on five measurements: service quality, service initiation, service advisor, service facility and vehicle pick-up. The results are tabulated, and then presented as a score on a 1,000-point scale. Unlike previous years, where all brands were lumped into one single category and only three made it to the podium, JDPA broke things into two segments: luxury brands and mass market brands. Lexus, with a score of 837, was at the top of the luxury brands, again – the automaker won last year as well. It was followed by Cadillac (827), who showed a big improvement over the previous year, and Jaguar (822). 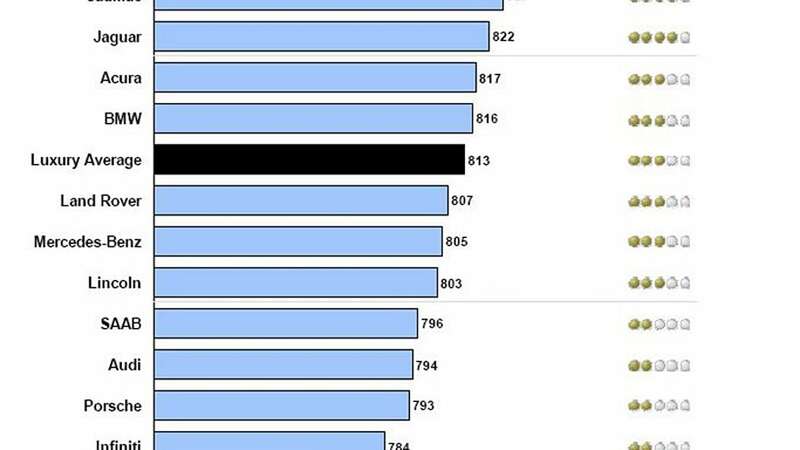 If you recall, Jaguar was at the top of the list in 2008 and finished second in 2009 (this is more indicative of a bar that continues to be raised rather than a decrease in service). Hummer (815) was top dog among mass market brands, followed by the now-discontinued brand of Saturn (808) and Buick (805). General Motors holds six of the top seven spots on the mass market category. 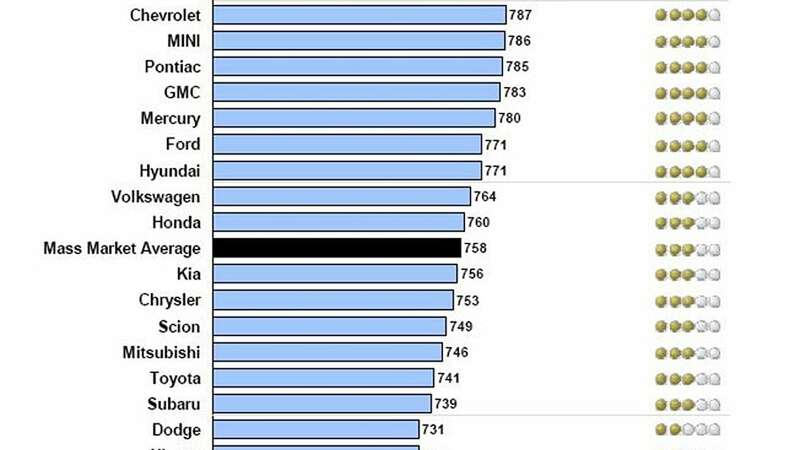 At the bottom of the list are Suzuki (693), Mazda (717) and Jeep (720). Overall, the industry is showing improvement as customers have expressed satisfaction with the ease of driving in and out of dealership facilities, parking convenience, thoroughness of work performed, the speed of repairs and flexibility of accommodating schedules. While that sounds like great news, experts say it most of those improvements may be attributed to the lower volumes of service bay traffic as sales slump in the new car showroom. Full release after the jump. WESTLAKE VILLAGE, Calif.: 24 February 2010 - The outlook for auto dealer service volumes and customer spending appears challenging, with decreases in service business brought on by depressed auto sales in 2008 and 2009 projected to continue for several years, whereby service volume may reach a low point in 2013, according to the J.D. Power and Associates 2010 Customer Service Index (CSI) StudySM released today. Dealer service traffic volumes are expected to decline by approximately 20 percent between 2009 and 2013, resulting in a 25 percent decrease in service dollars from owners of late (2005 to 2009) model year vehicles. Particularly in the current period of slow auto sales, most dealers rely on service business to stay profitable. "Over time, many vehicle owners gradually defect to non-dealer service facilities for repair and maintenance needs, particularly when the warranty period expires," said Jon Osborn, research director at J.D. Power and Associates. "With service customer retention becoming more crucial than ever during the next few years, dealerships must focus on not only providing superior levels of customer service, but also on enhancing convenience for vehicle owners and providing pricing that is more competitive with non-dealer facilities." The study examines satisfaction among vehicle owners who visit a service department for maintenance or repair work. The CSI rankings are based on dealer performance during the first three years of ownership, which typically represents the majority of the vehicle warranty period. Five measures are examined to determine overall customer satisfaction with dealer service (listed in order of importance): service quality; service initiation; service advisor; service facility; and vehicle pick-up. Lexus ranks highest in customer satisfaction with dealer service among luxury brands and receives an award for a second consecutive year. Lexus achieves an overall CSI score of 837 on a 1,000-point scale and performs particularly well in four of the five measures: service quality; service initiation; service advisor; and service facility. Rounding out the top five nameplates in the premium segment are Cadillac (827), Jaguar (822), Acura (817) and BMW (816). Among luxury brands, Cadillac and Mercedes-Benz post the greatest improvements from 2009. Among mass market brands, HUMMER ranks highest with a score of 815 and performs particularly well in the service quality and service facility factors. Also among the top five brands in the mass market segment are Saturn (808), Buick (805), Chevrolet (787) and MINI (786). Six General Motors brands (including brands GM is divesting) rank within the top seven in the mass market segment. Among mass market brands, Kia and Volkswagen post the greatest improvements from 2009. The study finds that overall satisfaction with dealer service has increased from 761 in 2009 to 767 in 2010, marking the 10th consecutive year of industry-wide improvement. Notable improvements are demonstrated in the service facility and service quality measures in 2010, compared with 2009. In particular, satisfaction has increased in the following areas: ease of driving in and out of dealer facilities; convenience of parking; thoroughness of the work performed; the total time required to complete service on the vehicle; flexibility of accommodating the customer schedules; and thoroughness of explanations. Several other time-related metrics have improved from 2009, including customer ability to get a service appointment on the same day as their initial inquiry call and service being completed the day that the vehicle was brought in for service. "These improvements may be due to not only an increased focus on customer satisfaction from dealers, but also are possibly a result of lower volumes of service traffic that dealers are now experiencing," said Osborn. The 2010 CSI Study is based on responses from more than 114,200 owners and lessees of 2005 to 2009 model-year vehicles. The study was fielded between October and December 2009. J.D. Power and Associates measures dealer service in various countries around the world, including Australia, Canada, China, France, Germany, India, Indonesia, Japan, Malaysia, Mexico, New Zealand, the Philippines, South Africa, Taiwan, Thailand and the UK. Headquartered in Westlake Village, Calif., J.D. Power and Associates is a global marketing information services company operating in key business sectors including market research, forecasting, performance improvement, training and customer satisfaction. The company's quality and satisfaction measurements are based on responses from millions of consumers annually. For more information on car reviews and ratings, car insurance, health insurance, cell phone ratings, and more, please visit JDPower.com. J.D. Power and Associates is a business unit of The McGraw-Hill Companies. Founded in 1888, The McGraw-Hill Companies (NYSE: MHP) is a leading global information services provider meeting worldwide needs in the financial services, education and business information markets through leading brands such as Standard & Poor's, McGraw-Hill Education, Platts, Capital IQ, J.D. Power and Associates, McGraw-Hill Construction and Aviation Week. The Corporation has more than 280 offices in 40 countries. Sales in 2008 were $6.4 billion. Additional information is available at www.mcgraw-hill.com.